You could just add a screen before the title. 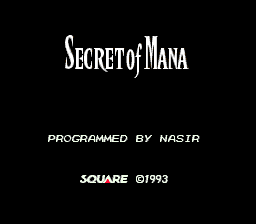 Add a short credits list for those who have helped you and whose hacks you've adapted and have the Square logo there as well as the Secret of Mana: Relocalized thing and keep "press start" for the title screen. Wouldn't that solve all the woes at once? That's no simple feat. The whale sound Squaresoft logo screen is a splash screen that stalls as the game loads the background image, text crawl, and pink birds. One does not simply add a new screen. As I said though, I can hijack that splash screen and modify it however I like. I heavily prefer literal translations for the spell names. I don't find Detect or Burst to be awkward. Burst in particular is a good description because it doesn't necessarily imply fire. Despite a similar graphic, I don't think burst is intended to be a type of flare spell. Honestly, I feel that you might be contextualizing it a bit too much based on the visuals over the lore of it being a wood/plant elemental spell. Generally speaking I prefer liberal use of literal translation over excessive localization as I'm always concerned with trying to understand the intent of the creators as much as possible. That said, I understand your project is a relocalization and I like the attempts to make some things more consistent as with the weapon name changes. Just not so much when it comes to the spells. Thanks Vanya, I appreciate this kind of feedback. I was worried that this change might be a bit of an overreach. I've just been looking at this project for so long that is hard to keep things objective. I'll hear a little more feedback and in the morning I'll compile the update and resubmit the changes. Any thoughts on the changes to the system messages? I feel like I'm taking crazy pills. 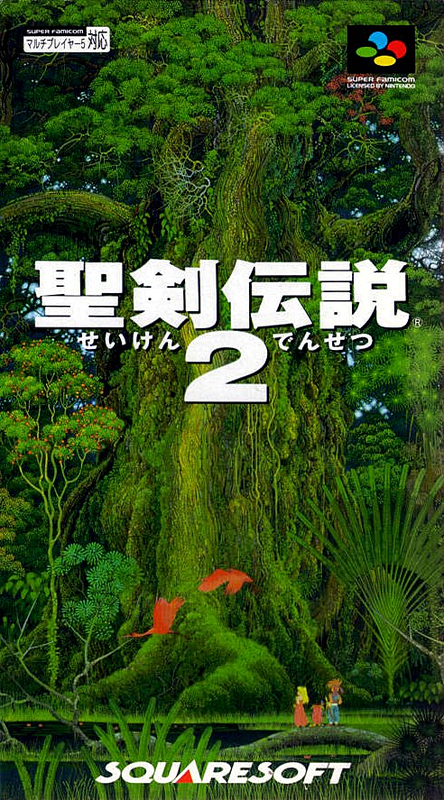 Do people actually think the title screen looks better with the Square Logo in front of the tree? I think the Square logo makes the composition nicer, more symmetrical. So I guess that's a yes. Your not crazy, the right looks way better. Yeah, I like the Square logo there. I much prefer the yellow writing but there is already a Square screen with Flammie noises so I don't know if its necessary to have on the title. I'm on the same crazy pills I guess. Text is a huge blemish on that, or nearly any image. Pretty much always. Especially bureaucratic text like copyright or trademark text; those should never be present on art except ironically, sarcastically or satirically (etc.). The bureaucratic space-wasting text gets its day at the start of the text crawl, let the logo be a logo and keep the lawyers away from art (or whatever villain convinces people to damage their art with little TMs, (R)s and (C)s). It's not even necessary from a legal point of view: you don't need to declare copyright for copyright protection and Square Enix has Secret of Mana's trademark registered so a label is also unnecessary for trademark protection (disclaimer, I am not a lawyer, but have looked into this for business reasons before). 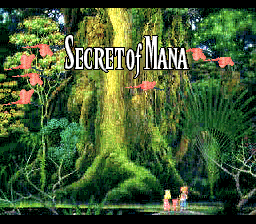 Personally, I'd prefer it without the "Secret of Mana" title even, but the image is a blurry mess behind the logo (and you [no one in particular] have no idea what a pain it is to modify the compressed image data). Edit: Anyway, Timbo, do what you like the look of; people will be able to leave all the legalese on if they want using various options in Turbo's [Title Screen] options section (I'm close to release; one critical bug to go). If you include the full English legalese text block at the very end of the text crawl (or an equivalent amount of padding), but put a text crawl terminator (0000) before the legalese so it never shows, I can do the legwork to allow users to turn it on, replace it with the smaller Japanese one, etc. I'd add the copyright symbol for correctness. Leaving them out just gives it a cheap Famicom bootleg feel. You're awesome Queue. Let's be crazy together. I really like the title logo in white, it has grown on me. 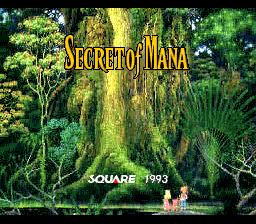 I say keep the Square Logo only because now with the white title logo and the Mana tree not as zoomed in on as before it looks a bit more like the SFC cover art. Does having the Square logo at the bottom effect the title logo? I noticed your comparisons had the title logo in yellow with the Square logo, but was in white without the logo. The intro hack I use reapplies the yellow pallet even I use it. I just didn't bother changing it back for the comparison. I intend to use the white title screen for Relocalalized, HDemake, and World of Balance. I have not read some previous posts, please tell me more about this 'HDemake', yes? Love the new system message format. It makes things more easy to process which is important in the middle of a fight. Also, I'm in on the crazy pills too. No square logo. Not needed. It's essentially Relocalized with the HD Version's Script instead of FuSoYa's. HDemake and World of Balance are both separate projects that use Relocalized as a base. World of Balance will have a Relocalized version and an HDemake Version. In other news, I just submitted Relocalized v1.5, so be on the lookout for that in a couple days. I'd remove both, logo and title. Let the image speak for itself. Too bad that would be problematic like someone else said. Regarding the Subtitle. It has been removed. 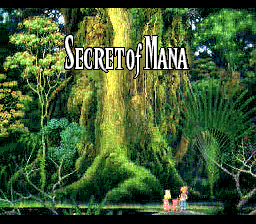 I ultimately decided to remove it, and the illusory frame it creates because I feel that the assymetry created by the unbalanced title draws attention to the trio below and makes the Mana Tree seem bigger and more fantastic. I did however add the "Square ©1993" to the unopened black title screen at the beginning of the crawl. The beginning of the intro/title screen looked very oblong with the title all the way at the top, the credits in the middle, and nothing at the bottom. It needed something at the bottom to frame the credits. Despite it being legalese, I kept the "©" symbol. It's inclusion balanced the text better horizontally and just looked better. Note: The title screen image on the download link is currently incorrect. There is no subtitle. -Major Overhaul to the entire system message system. -Changed "Tangled" status to "Slowed"
-Changed "Frostied" status to "Frozen"
-Changed "Ballooned" status to "Stunned"
-Changed "Shrunk" status to "Miniaturized"
-Changed "Engulf" status to "Burning"
-Minor adjustments to weapon and spell descriptions. -Removed subtitle from title screen. -Changed "Hit %" to "Accuracy %"
-Changed "Tinkly Barrier" to "Twinkly Barrier"
-Changed "Silver Chain" to "Silver Whip"
-Changed "Chain Flail" to "Morningstar Whip"
-Changed "Chain Hammer" to "Hammer Whip"
-Changed "Diamond Chain" to "Diamond Whip"
-Changed "Gigas Chain" to "Gigas Whip"
-Changed "Blue Sorbet" to "Blue Bavarois"
-Changed "Gas Cloud" to "Bluster Gas"
-Changed "Shadow x1" to "Shadow Boy"
-Changed "Shadow x2" to "Shadow Girl"
-Changed "Shadow x3" to "Shadow Sprite"
-Changed "Frost Gigas" to "Frost Giant"
-Changed "Fire Gigas" to "Fire Giant"
-Changed "Thunder Gigas" to "Thunder Giant"
-Changed "Sleep Flower" to "Sleep"
-Changed "The ultimate chain." to "The ultimate whip." -Corrected typo "The village is a shambles!" -Corrected typo "regain it's power"
-Changed "Water Palace" to "Water Shrine" at Gaia's Navel Cannon Man. -Fixed Pamaela's Grandfather's dialogue bug. -Changed Burst's icon from red to green to match it's graphics. -Continued to resist the urge to change "Flail of Hope" to "Vampire Killer". Some of the Status effect changes aren't actually new to this version went unmentioned. Secret of Mana has a number of inconsistently named status affects such as sleep and unconscious or slow and tangled. Weapons and spell descriptions may refer to tangled as slowed (or weight in japanese, thus leaden glare) or sleep as unconscious. All of these identical status have been merged and renamed. "Pygmized" has been renamed "Miniaturized" because "pygmy" is an offensive term. A few enemies got renamed as well. Since clouds are all made of gases, "Gas Cloud" is redundant, so I updated it to the remake's "Bluster Gas". The Shadow x1, x2, and x3 distinctions have always felt odd and a little 4th wall breaking to me so they were renamed Shadow Boy, Girl, and Sprite respectively. "Jabberwocky" became "Jabberwock" because the creature in Lewis Carol's Jabberwocky is called the Jabberwock. The gigas bosses were rechristened as giants. Gigas is kind of a generic Japanese term for giant. In Greek Mythology Gigas is one of the Gigantes (Giants). To me, these creatures look more Norse than Greek, so I localized the name. Before people start complaining, just be glad I didn't change them to Jotunn. A few weapons got an overhaul as well, I've talked about this before so I won't go deep into detail. All of the whips, are actually whips now. Before people complain please understand that I realize that the Hammer and Morningstar Whips are preposterous but it's still less preposterous than calling a whip a flail, morningstar, or combat chain (chain whip). The "Were-buster" got renamed from "Lycanslayer" to "Beastslayer". Lycan specifically refers to wolves and since the "Were" in this context refers animals, this localization made sense.